The first birthday of your kid is super special. Make sure to make it memorable and give the maximum amount of happiness to your child by celebrating his or her first birthday of life with you. So, don’t forget to order the most delectable cake for your child from FlowerAura’s wide assortment of 1st birthday cakes. 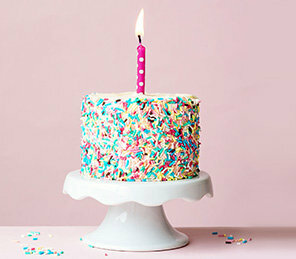 Birthdays are an important milestone in everyone’s life and people celebrate this day every year on their life. But, the among the ‘n’ times of birthdays, the first birthday holds a special significance in life. The first birthday of a baby is a joyful time for the entire family. It marks the completion of first 365 days of a new born baby in this world. If you are a parent to a lovely child who have just completed or going to complete 1 year with you then, this day will seem like yesterday to you. You would like to freeze every single moment with your child. Thus, your child’s first birthday deserves a memorable celebration and how can be a celebration complete without a delicious cake. Since it’s your child’s first birthday, the cake has be to perfect that can make your kid’s first birthday an unforgettable one and leave your guests mesmerized. Finding a perfect cake that has been baked with the best quality ingredients is really difficult. But, you don’t have to worry about it because FlowerAura offers you the most delectable 1st birthday cakes that are freshly baked and moist in texture. Whether you are looking for a 1st birthday cake for boys or girls, you can find a huge variety of mouth watering first birthday cakes at FlowerAura. We offer you a wide assortment of delicious first birthday cake ideas that can help you make your kid’s first birthday celebration a memorable one. Our delectable range of first birthday cakes are available in different shapes and designs that can attract the maximum eyeballs on your kid’s birthday party. Our first birthday cake ideas include number cakes, cartoon theme cakes, superhero theme cakes, two-tiered cakes etc. If you are looking for a unique first birthday cake for a boy then, you are at the place. Some of the best 1st birthday cakes for boys available on our website are “Single Number Chocolate Cake”, “Mickey Mouse Clubhouse Cake”, Director’s Clapboard Cake”, “Two-Tier Piano Cake” etc. And, if you are looking for a scrumptious 1st birthday cakes for girls then, you should definitely check out our melt-in-mouth range of first birthday cakes for girls. Some of the best 1st birthday cakes for a baby girl available on our website are “Pinkalicious Me”, “Single Number Chocolate Cake”, “Princess Of The Castle”, “Minnie Mouse Exuberance” etc. All of our cakes are baked with the best quality ingredients and with utmost perfection. Why Should You Order First Birthday Cakes Online from FlowerAura? We offer a wide variety of unique and creative first birthday cakes. To order a first birthday cake online from FlowerAura, all you need to do is to visit our website, select a cake, and place your order comfortably seated at your home. You absolutely need not to worry about the delivery time as we ensure an impeccable cake delivery services. Once your order for a cake is received, we ensure doorstep birthday cakes for girls delivery within 4 hours of your order placement. It means that we provide same day cake delivery. Also, if you can make your kid’s first birthday super special by making your child cut the cake at 12. How? You can always rely on FlowerAura to order cakes online at midnight because we also ensure midnight cake delivery. With FlowerAura’s online first birthday cake delivery, you can enjoy free shipping on online orders of cakes from us.So, make sure to celebrate your child’s first birthday in a grand way by ordering a luscious first birthday cake online from FlowerAura.